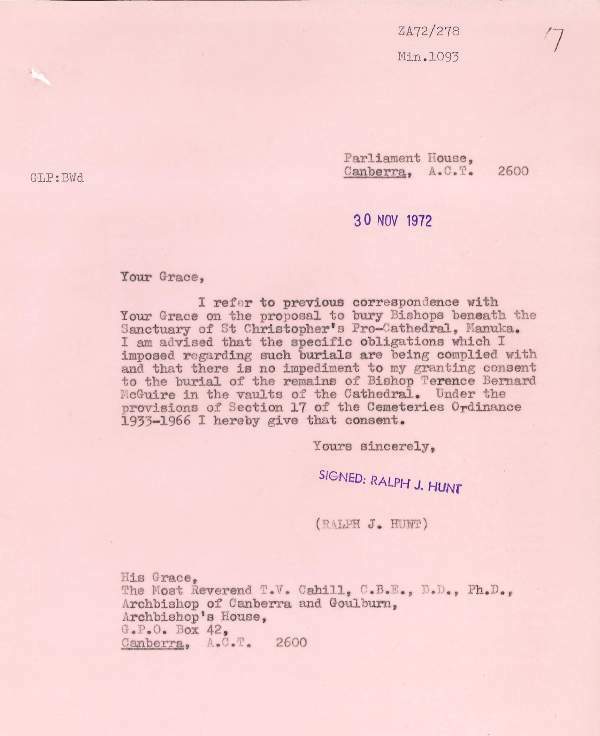 On the 1st of June 1972, the Catholic Archbishop of Canberra and Goulburn, The Most Reverent Thomas V. Cahill wrote to Ralph Hunt, Minister for the Interior, to query whether it would be possible to consider ‘the burial of bishops beneath the sanctuary’ in what was at that time St Christopher’s Pro-Cathedral in Manuka, and if so ‘what would be required to make this possible’. The Christian tradition of burying bishops under the sanctuary of the cathedral in which they served is centuries old. It is believed to have originated from St Peter’s Basilica in Rome, which was built upon the grave of one of Jesus’ twelve apostles and early leader of the church, St Peter. This request gives us historic insight into a local religious institution and the government processes required to approve this unusual request. For this reason the request for permission to bury bishops under St Christopher’s Cathedral is our March Find of the Month. 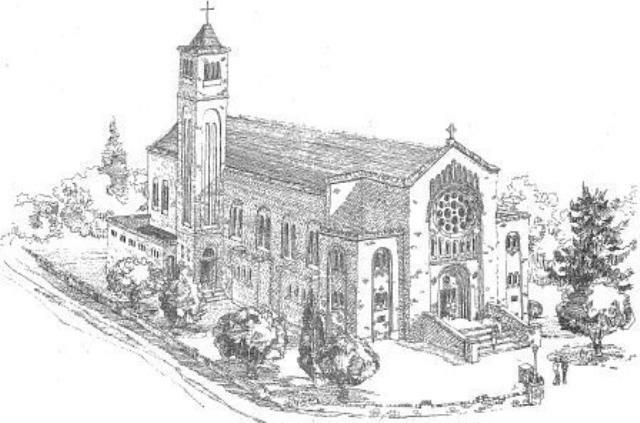 In 1972, major extensions were underway at St Christopher’s to both double its seating capacity and provide additional liturgical space. Archbishop Thomas Cahill was responsible for the project, and under his guidance, St Christopher’s progressed from being a pro-cathedral (a parish church used as a cathedral) to a full cathedral, and the seat of the Archdiocese of Canberra and Goulburn. The architect he employed on this project, Mr. Clement Glancy, was the son of the original architect, and this allowed for a seamless style transition from old to new. Although busy with managing the extension, Archbishop Cahill soon recognised that there was ample space beneath the sanctuary that could be developed into a crypt for the burial of local bishops. Under Canon Law (1176), the Catholic Church recommends that the ‘pious custom of burying the bodies of the deceased be observed’ through interment or entombment. Although cremation is allowed, the Pope has recently confirmed that the permanent collection or scattering of ashes is not, as this does not reflect the Christian belief of paying respect to both the soul and the body. 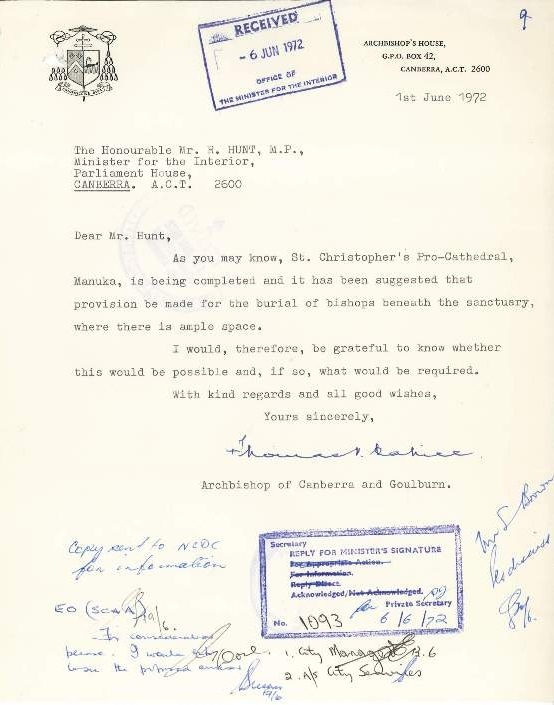 On the 1st of June 1972 Archbishop Cahill wrote to Minister Hunt to request consideration for the interment of bishops beneath the sanctuary of St Christopher’s. The Minister’s agreement to the interment may have helped to ensure that St Christopher’s could progress in standing from a parish church to a full cathedral. 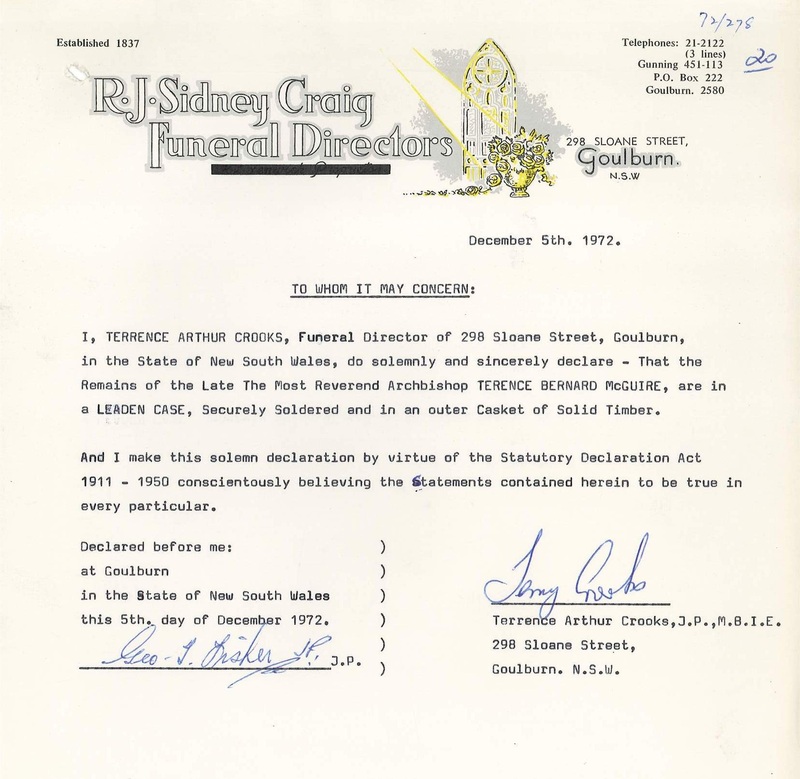 Although it was not possible to create a private cemetery on the site, under Section 17 of the Cemeteries Act 1933 (Cth) the Minister was able to approve burials outside of a public cemetery on an individual basis. Two major conditions needed to be addressed for this approval to be granted. The first condition concerned the meeting of strict structural requirements in the building of a vault or crypt, the second condition was the appropriate treatment of the body on health grounds. 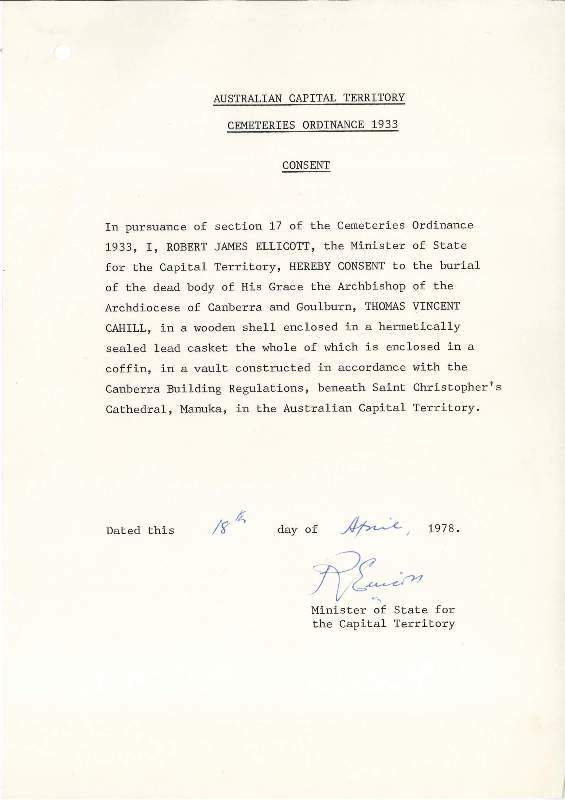 By the 16th of August 1972, a letter from Archbishop Cahill notes that Mr. Glancy had prepared and presented plans for the vault to the Department of the Interior's Chief Architect and that once approval had been given building could commence on the site. Confirmation of approval was given by phone, and noted on the file. The same letter agrees to the terms relating to the treatment of bodies. On this basis, requests could now be officially made to use the crypt. Archbishop Cahill did not wait long to place his first request. The Most Reverend Archbishop Terence Bernard McGuire served the Diocese of Goulburn, and later Canberra and Goulburn from 1938 to 1953. He had steadfastly refused to move from his base at Goulburn to Canberra, and eventually resigned from his post due to ill health. It was perhaps ironic then that his remains were chosen to be moved and be the first placed in the crypt at St Cristopher’s. Upon his death his remains had been buried at Inveralochy Agriculture and Trades College, Tarago, a school that he had built. However, with the sale and closure of the school a new place of rest was required. 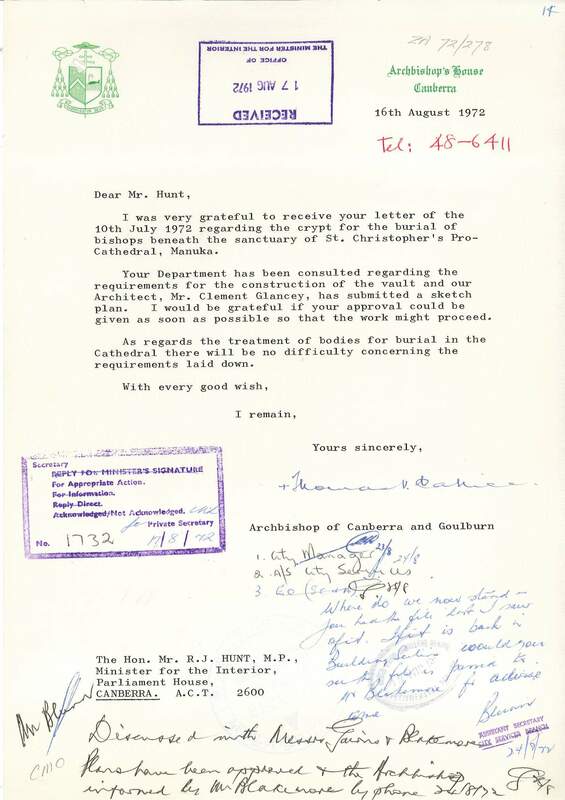 On the 30th of November 1972, the Minister of the Interior wrote to Archbishop Cahill giving his official consent to bury the remains of Archbishop McGuire in the crypt under St Christopher’s. 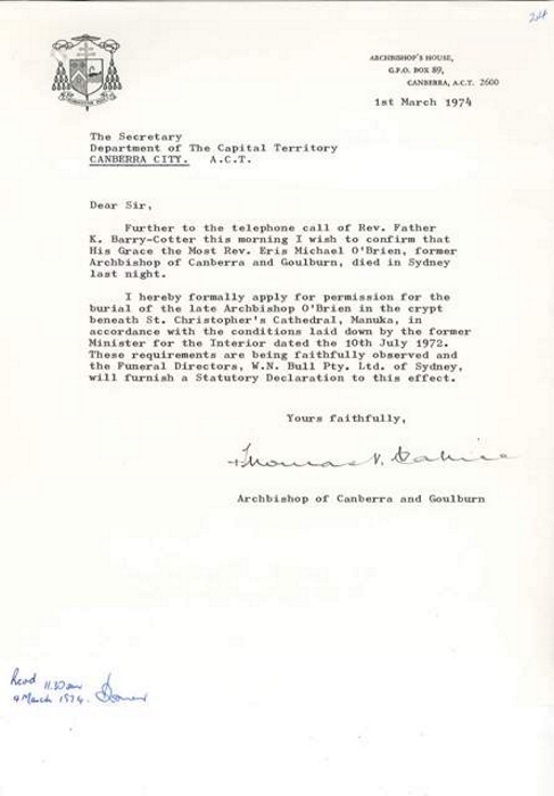 Archbishop McGuire’s remains were accordingly moved from Goulburn on the 9th of December 1972. The second Archbishop of Canberra and Goulburn, the Most Reverend Dr Eris O’Brien served the Diocese from 1953 to 1967. Archbishop O’Brien was a published historian and close friend of local historian Manning Clark. His championing of independent secondary Catholic Education helped to secure government funding. After retiring due to ill health he passed away on the 28th of February 1974 and became the second bishop for whom interment in the crypt was requested. Archbishop Cahill served his diocese from 1967 to his death in 1978. During his time as Archbishop he expanded the parish branches in Canberra and also served on the Second Vatican Council. Upon his death his remains were also placed under the sanctuary in the Cathedral he helped to build. The three bishops of Canberra were joined at rest by The Most Reverend Archbishop Morgan, in 2008. 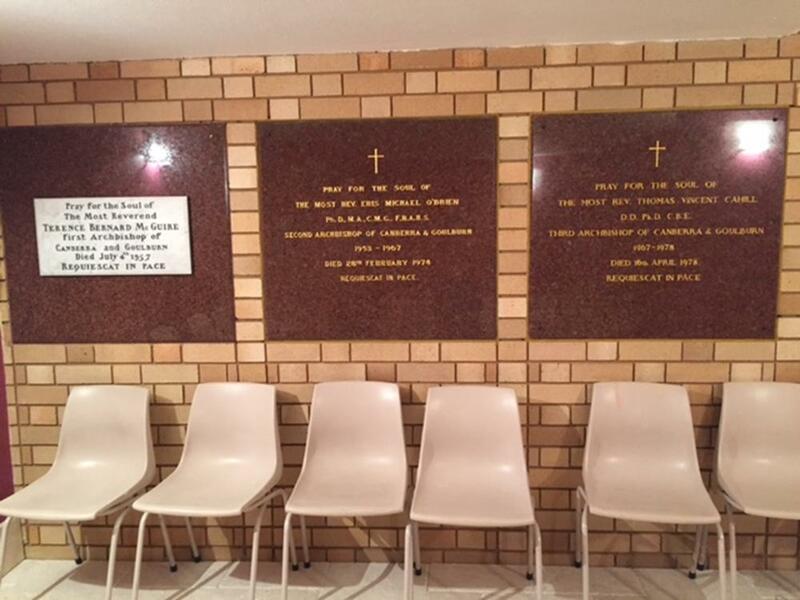 The Parish of St Christopher’s has kindly provided us with a photo (below) of their plaques marking their final resting place in the crypt. Archives ACT wishes to thank Michelle O’Connor, Parish Secretary, St Christopher’s Cathedral. If you would like a copy of this record please contact ArchivesACT through our “Request a Record” service. If you would like to view the original documents you can also contact us to arrange a suitable time to visit the Archives ACT Reading Room located on the top floor of the Woden Library.